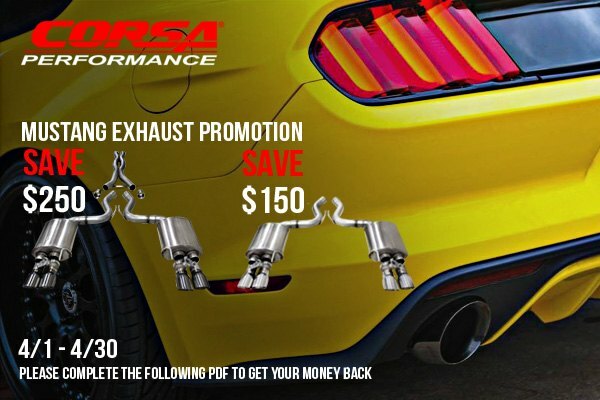 DFWstangs Forums > Vendors > CARiD.com > Mustang Exhaust Promotion from Corsa at CARiD! If you want to unleash the hidden power of your Mustang and let everyone hear its voice, Corsa exhaust system will be the best bet! Corsa produces exhaust systems with the most aggressive sound level, a deep growl at idle and bold sound under acceleration which screams at high RPM. All their components are constructed of premium grade, 304 Stainless Steel to make it last a lifetime. Today we are here with the new offer on Corsa exhausts. For 1 month only Corsa offers a wonderful deal - receive up to $250 mail-in rebate on qualifying CORSA Performance GT Exhaust. The offer is valid until April 30, 2019. Please fill in the following PDF form to get your rebate. Last edited by carid; 04-09-2019 at 07:29 AM.